The aim of this challenge is to write a script that allows the uer to input the equation of two straight lines (Line 1: y=ax+b, Line 2: y=cx+d). The program will then calculate the coordinates of the intersection point if such a point exists! 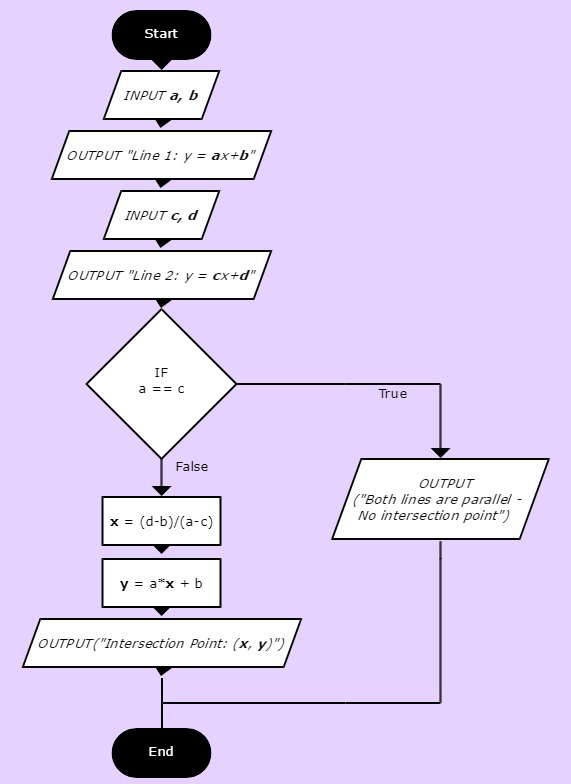 Complete your code here, using the steps described on the above flowchart. Using Python Turtle to trace the lines! The following code uses Python Turtle to trace both lines. 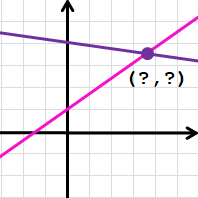 Can you write a computer program that takes the (x,y) coordinates of two different points and calculates the linear equation (y = ax + b) of the straight line joining these two dots. Note that in case of a vertical line (if x1 == x2), you will not be able to calculate the slope a. The equation of your straight line would then be x = x1.